Children are a heritage from the Lord, offspring a reward from him.~ Ps. 127:3: What is it? A Fox? What is it? 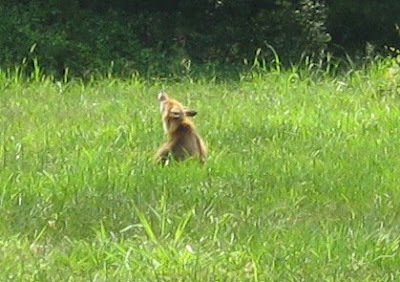 A Fox? 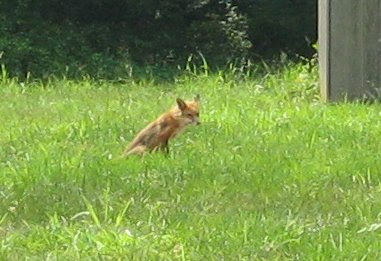 We have a pet in our yard that we cannot identify. 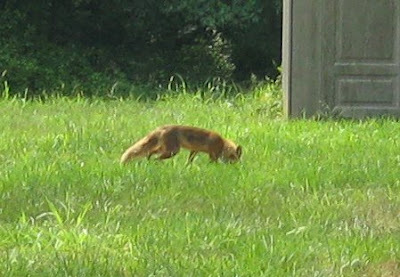 Although I do believe it is a fox, I cannot tell what kind. I have searched the web a few times. If you have a clue please let me know. The pictures are blurry because for some reason my zoom is going out on my camera (just like my laptop is giving out - boo hoo!!!.). She looks a bit red in the photos and from a distance but up close she is actually blond/yellow with gray/black splotches. 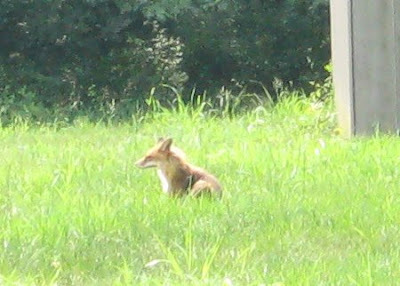 But here is "foxy" just hanging out in our yard acting like the family dog out there. I really think if a guest drove up they would have thought she was our dog.